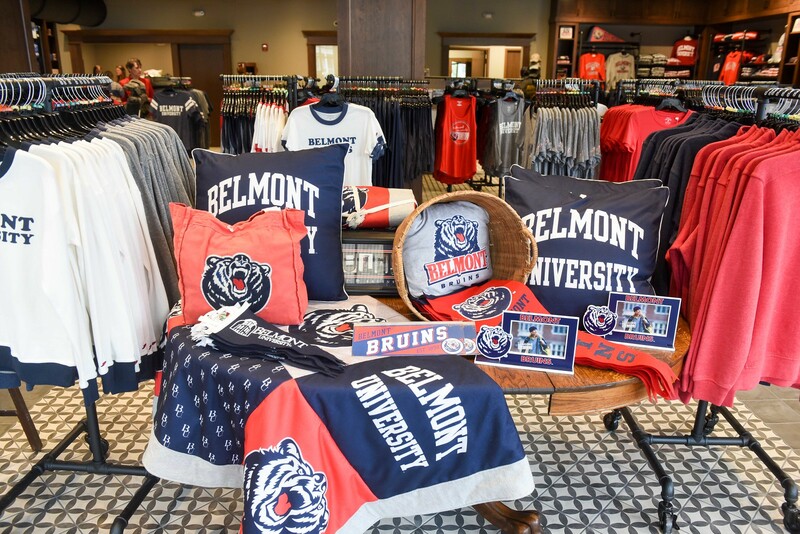 Belmont Store Grand Opening on the Belmont University campus in Nashville, Tenn. March 13, 2017. 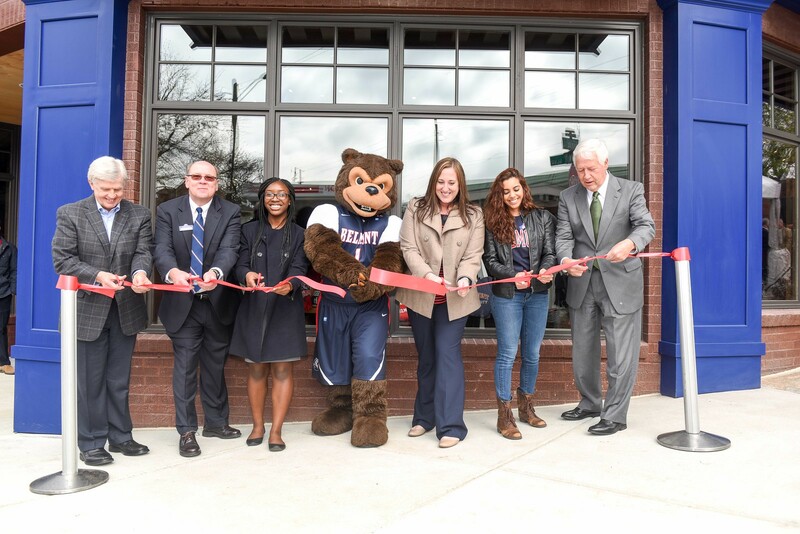 With campus mascot Bruiser the Bear manning a pair of scissors, Belmont students and University administrators officially cut the ribbon this morning on The Belmont Store, a new campus retail outlet and spirit shop located on the former property of the Athlete’s House. Located at the intersection of Belmont Boulevard and Portland Avenue, the property provides a convenient location for campus members seeking to purchase apparel and supplies. 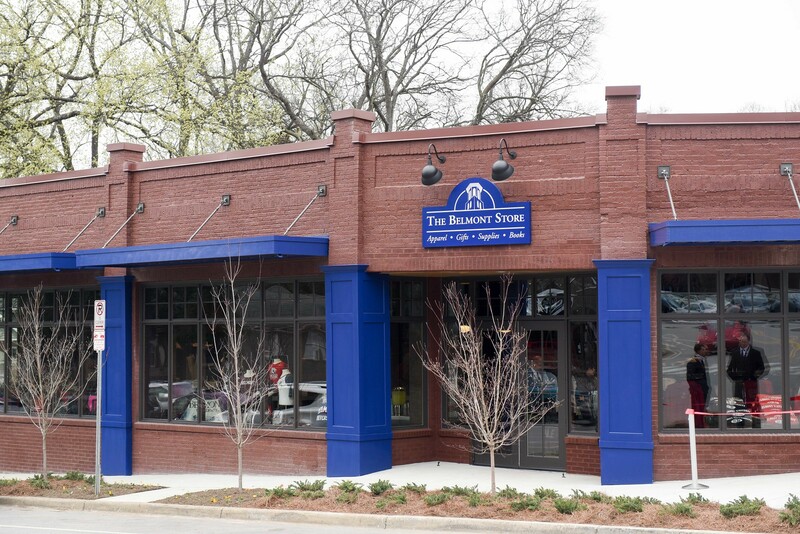 It further solidifies the southern end of campus as a student-centered area as the Belmont Store sits near the recently renovated Gabhart Student Center and joins a number of student-run businesses along Belmont Boulevard (House Of, Boulevard Record Shop) along with restaurant outlets McAlister’s Deli and Curb Café. The stand-alone building will also enable the store to develop its own brand in a more visible and highly trafficked retail location, and the dedicated spot allows University staff to think about processes, like textbook delivery, in a new and innovative way in terms of providing services to the campus community. In 1932, Herman Lay became an independent snack food distributor in Nashville and located his potato chip manufacturing office at 1700 Portland Avenue. The site became a distribution center enabling his chips to be delivered to shops around the city, and that warehouse sat across the street from an Esso gas station owned by Ed and Bernice Johnson. The couple often helped Lay keep his potato chip trucks on the road by allowing him to pay for gas on credit. In 1948, in gratitude for the help, Lay offered the Johnsons a chance to buy stock in his company. H.W. Lay & Company gradually grew, merging with the Frito Company in 1961 and with Pepsi-Cola in 1965, where Herman Lay became chairman of the board until his retirement in 1980. Thanks to that original friendship—and the Johnsons’ love and support for Belmont students and faculty—more than $18.6 million in scholarship donations can be sourced to the helping hand Ed and Bernice Johnson offered entrepreneur Herman Lay.